Jon Levisohn holds the Jack, Joseph and Morton Mandel Chair in Jewish Educational Thought at Brandeis University, where he directs the Jack, Joseph and Morton Mandel Center for Studies in Jewish Education. 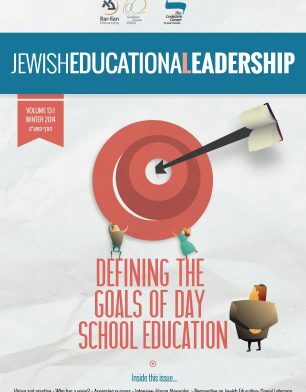 This article develops ideas presented earlier in “Should Jewish day schools aspire to create educated Jews,” HaYidion, Summer 2010, and “A new theory of vision,” HaYidion, Autumn 2014. While the topic of “vision” has been central to Jewish thought since the time of the prophets Isaiah and Obadiah (see 1:1 in both), Jewish educators in particular have been focused on vision for about twenty years. In the early 1990s, under the leadership of Professor Seymour Fox, the Mandel Foundation launched an initiative that it called, at first, the Educated Jew Project, and which was subsequently renamed the Visions of Jewish Education Project. That project produced a series of articles and convened a series of meetings, and ultimately led to the publication of the edited volume Visions of Jewish Education (Fox, Scheffler, Marom, eds., 2003). The Mandel Foundation’s project was framed by a particular theory of vision. Indeed, we can already see an important element of that theory in the original name of the initiative. For Fox, the primary architect of the project, the easiest and most straightforward way to think about a vision is to ask, what is the ideal product of the educational institution? What, in other words, is the picture or image of the educated Jew that we aspire to produce in this school or camp or program? This straightforward way of thinking about vision had the additional benefit of an implicit comparison to the “educated man” tradition in general philosophy of education, a tradition that included important articles by R.S. Peters (1970) and Jane Roland Martin (1981). When the project switched names and become the Visions of Jewish Education Project, it did so because the architects came to realize that the notion of the “educated Jew” carried with it the unfortunate connotation that education might ever reach a point of completion, that one could arrive at an intellectual place of having-been-educated with no further need for study or exploration. That was never their intention (which is why they talked and wrote about the “educated Jew,” not the “ideal graduate”). So whatever benefit was to be gained through the implicit reference to Peters and Roland Martin, it would not be worth it if readers were led to believe, incorrectly, that Fox and his colleagues imagined that graduation from a particular institution could ever mean the end of one’s education. Back in 1959, Fox was not using the language of “vision,” which does not appear in that paper. Nevertheless, his manifesto for philosophy of Jewish education should sound familiar to us. A philosophy of Jewish education ought to pursue the question of purposes, of aims, of educational goals. And the way to pursue those questions, he proposed, is by developing robust images of the ideal educated Jew, what he called in that article “embodiments,” images which themselves are excavated out of the Jewish tradition. What does such a robust image embody? It embodies a set of answers to fundamental, existential questions. But what do you do with your vision of the educated Jew, once you’ve got it? In later years, Fox spent a great deal of time thinking about the relationship of theory and practice, and devised what came to be known as the “Five Levels Theory” (which appears in a talk in 1997 (Fox, 1997) and in his monograph on Camp Ramah (Fox and Novak, 1997)). Without getting into the details here, Fox was trying to conceptualize a set of steps by which theory or vision gets translated into practice, starting at the most abstract level (level one) and becoming increasingly more concrete (down to level five). We should note that Fox denied that his five levels were hierarchical. He pointed out that one can sometimes traverse the five levels from the concrete up to the abstract – deriving ideas from practice – just as one can traverse them from the abstract to the concrete. The problem, however, is that there is a difference between hierarchy on the one hand and directionality on the other. When Fox denied that his five levels were hierarchical, he was really denying that they were unidirectional. But hierarchical they surely are. How do we know? There is plenty of textual evidence, but perhaps the most obvious is Fox’s memorable quip, at the beginning of the Camp Ramah monograph (Fox and Novak, 1997, p. 3), explaining how we need to begin with a bold vision even if we know that it will get adulterated in the process of implementation: “If you start with cognac, you will be lucky to end up with grape juice. But that’s not a bad result when you consider the alternative—if you start with grape juice, you’ll probably end up with Kool-Aid!” The idea here is that the biggest and most fundamental questions about human existence, the most general questions, are like cognac. The answers to those questions direct the next level down, which directs the next level down, which directs the next level down. As the ideas cascade down, there is some inevitable dilution or adulteration. That process just raises the stakes: our original ideas better be powerful enough to have an impact down there in practice, at the end of the process. To be sure, there are feedback loops back up the ladder. We sometimes learn something, by putting an idea in practice, about that idea. We refine our conception of purposes. But fundamentally, the conception at work in Fox’s idea of vision is that philosophy – by which I mean now the answers to the most fundamental questions – is at the top of the hierarchy. Theory governs practice, or ought to do so. Fox’s hierarchy does capture our sense that our practices ought to be grounded in something bigger, something more fundamental. We should share Fox’s worry about aimless practice. We should aspire to maximum intentionality, and we should worry about idiosyncrasy. We should believe that big ideas are important. We should want to start with cognac, not with grape juice. We should not want educators to be satisfied with the status quo, doing things simply because this is how they’ve always been done. We want them to ask why, persistently. But there are two problems here. The first problematic element is the hierarchical nature of the relationship of theory to practice that we have just been discussing, the way in which questions at a lower level of abstraction are nested within – and thus governed by – questions at a higher level of abstraction. In reading Fox, one gets the sense that, if we could just figure out our deepest questions, we would be well on our way to developing the kind of educational visions that would guide our practice productively and aspirationally. And the second problematic element is the very idea that a vision is, at its core, a picture of the ideal educated Jew. Why are these issues problematic? Let me turn to a delightfully clear articulation of the idea of vision by Daniel Pekarsky (1997). In that article, Pekarsky makes liberal use of the conjunction “and/or” in articulating what visions are about: they are about “the kind of human beings and/or communities that need to be cultivated” (p. 32), “the kind of human being and/or community that the educational process is to bring into being” (ibid. ), “what Jewish existence at its best in its social and/or individual dimensions looks like” (ibid.). Given the context of the discussions of “the educated Jew” in the 1990s, this little conjunction is significant. Without calling attention to it, Pekarsky is making the point that a conception of vision that includes only a picture of an educated individual is too narrow. We are sometimes equally animated by a picture of the kind of community that we want to create. That too is an educational vision, or part of one. But if that is the case – if a vision can properly include not just a conception of the ideal educational product on an individual level, but also a conception of the ideal community – then we might wonder what else it can properly include. Perhaps, that is, we might embrace Fox’s demand that practice should be animated by ideas while also acknowledging that, when we examine intentional practice – when we ask ourselves about the theory that is enacted in that practice – there is actually a diversity of ideas that come into play. These include not just ideas about the ideal educated individual or Jew, and not even just ideas about the ideal community, but also ideas about teaching, and ideas about learning, and ideas about the specific subject area that we are teaching, and more. I will return to this point about the diversity of ideas that animate (or should animate) practice below, but at this point, it may not yet be clear why any of this matters. Why does it matter what kinds of ideas properly animate practice? Why does it matter if Fox’s theory of vision is hierarchical and overly concentrated on the biggest and most abstract questions? To try to address this concern, let’s consider, next, a concrete example of an effort to infuse practice with intentionality. (The following paragraphs are based on “Should Jewish Day Schools Aspire to Create Educated Jews,” HaYidion, Summer 2010.) Some years ago, a colleague shared with me a list of “enduring understandings” and “essential questions” in Tanakh. The enduring understandings included, for example, “the Torah is the record of G-d’s revelation” and “The historical fact of the Jewish people is a function of its relationship with G-d, which is defined by its observance of Torah and mitzvot.” These are the kinds of big ideas about Tanakh that, for this author, every educated Jew should know. And notice that, if what we are seeking is something that every educated Jew should know, they are going to be big and general ideas, not small or specific ones. They are going to be fundamental ideas that will make a difference in their lives. This approach to increasing the intentionality of practice seems to require a focus on the ideas about the subject that are linked to basic theological stances and that generate fundamental ways of being in the world. But when we actually turn to practice, we should notice that these ideas are dramatically unhelpful for creating compelling lessons in Tanakh. They do not allow educators to select certain appropriate texts, rather than others. They do not generate instructional approaches or guide one towards the design of compelling learning opportunities. They are ideas about Tanakh, to be sure, but they are so far removed from the nuances of actual biblical texts that one would be hard-pressed to explain how any particular lesson ought to promote these ideas. Thus, if a teacher were to tell us that her goal in teaching, say, Exodus 19 (about the Sinaitic theophany) is to promote the idea that “the Torah is the record of God’s revelation,” we should be concerned, not pleased, for she has flattened a rich and nuanced text into mere cliché. The text itself is full of soaring imagery, complicated choreography, and interpretive difficulties, all of which seem to be lost in the rush to derive a kind of moral-of-the-story big idea. We might want to sit down with this hypothetical teacher and say something like the following. I understand that you are concerned about promoting this big idea. But there’s a disconnect between the big idea and what you are thinking about or wanting to do in your classroom. What are you going to ask, as you encounter the text? What are you going to ask the students to do? The big idea about the Torah as a record of God’s revelation doesn’t actually get you very far. So let’s think harder about what, specifically, you want to accomplish in teaching Exodus 19. What do you think this text is about? What challenges (interpretive or otherwise) does it present to the students? What skills or dispositions are the students working on, that will be advanced by an encounter with this text? Why is this the right text to be studying at this moment in their careers as students of Tanakh? Once we spend some time at that level of detail, we may be able to develop some goals that are really about this text rather than about Tanakh in general. Nor is this all. We may also, if we aspire to be maximally intentional, encourage this hypothetical teacher to think about the kind of classroom community she aspires to create. We might ask her about her working hypothesis about the relationship between the things that she does in the classroom and the learning of the students. In our pursuit of maximum intentionality, we have to introduce a wide array of ideas – that is, ideas about a wide array of topics, not just about the Torah as a record of God’s revelation. The point here is not to deny that fundamental questions about the educated Jew are ever relevant to practice. They surely are. But the idea of the educated Jew tends to encourage us to think about ideological stances on issues of ultimate importance. When we do so, we ought to acknowledge that, the more abstract our ideas, the further removed they often are from providing the kind of guidance of educational decision-making that we want ideas to have. The more ultimate the question, the greater the potential for what Alfred North Whitehead called, memorably, “inert ideas.” And we ought to acknowledge, further, that the ideas that feed into intentional practice are multiple and diverse. Pedagogic guidance emerges less from ultimate stances, and more from finer-grained conceptions of what kinds of questions and answers are important within a particular subject, and what good teaching looks like, and what it means to learn. An educational vision is not, then, simply a conception of the ideal educated Jew or the ideal day school graduate, as important and profound as that may be. Instead, an educational vision is made up of a set of animating ideas about a range of important questions, all of which – collectively – inform and animate the kind of intentional practice that we desire. In addition to questions about individual human flourishing, these ideas also consider questions about the ideal community, and the nature of teaching, and what it means to learn, and what this particular subject area is all about. In Jewish educational contexts, animating ideas may also focus on the nature of the Divine and the Sacred, and what we think is core to Judaism. When we encourage the development of visions of Jewish education, therefore, we ought to recognize that those visions will encompass this diversity, and not always with the neatness that Fox envisioned. Practice is animated by different kinds of ideas, in different ways. Our goal, in promoting vision, is to maximize the intentionality of practice. “We ought to have,” as Pekarsky (2006) writes, “reasons for what we say and do.” We ought to identify and articulate the reasons for the choices we make about curriculum and pedagogy and other educational policies, and interrogate those reasons critically. To the extent that those conversations lead us to the question of what kind of person we aspire to “produce” in our school or program; that is all well and good. But that is not the only big idea that should properly animate our practice. Fox’s theory of vision presumes that the answers to our pedagogic questions can be derived from our answers to the biggest, most abstract human existential questions. I think this is a mistake, and as a result, visions of the educated Jew are often surprisingly ineffective in doing the very thing that they are supposed to do, namely, to guide practice. Instead, I propose that we think instead about vision as a set of diverse animating ideas. Our purpose, in developing these ideas, should never be the ideas themselves – for their own sake, as it were. Instead, our focus should always be on the ways in which animating ideas inform our practice, or the ways that they ought to do so. Fox, S. (1997). From theory to practice in Jewish education. In Twelfth World Congress of Jewish Studies. Jerusalem: Mandel Institute. Fox, S., & Novak, W. (1997). Vision at the heart. Jerusalem: Mandel Institute. Fox, S., Scheffler, I., and Marom, D. (eds.) (2003). Visions of Jewish education. Cambridge: Cambridge University. Martin, J. R. (1981). The ideal of the educated person. Educational Theory, (31), 97–109. Pekarsky, D. (1997). The place of vision in Jewish education reform. Journal of Jewish Education, (63), 31–39. Pekarsky, D. (2006). Vision at work: The theory and practice of Beit Rabban. NY: Jewish Theological Seminary of America. Peters, R. S. (1970). Education and the educated man. Journal of Philosophy of Education, (4), 5–20.